This post is for anyone who has never put avocado and eggs on toast. Is there anyone out there who hasn’t? We’ve been doing this forever. Forever meaning as long as I started eating avocados…which is a loooonnnnggg time. 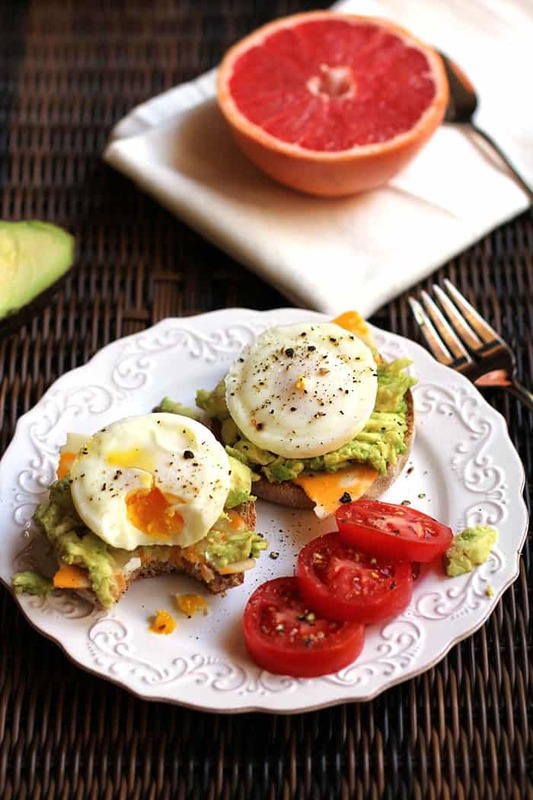 Poached Egg Avocado Muffins are one of very favorite “quick and easy” dishes to prepare. It looks like breakfast sandwich but I make them for lunch and dinner too. It’s perfect for those days when you are running from morning to night, and don’t have a lot of time for meal prep. Picking up a couple of avocados every time you go to the store is key for this recipe. To make these great, you have to have a perfectly ripe avocado. That’s why I try to keep a couple on my counter/in my fridge at all times (because we also make a lot of Tex-Mex). To test for ripeness, just press down with your thumb. 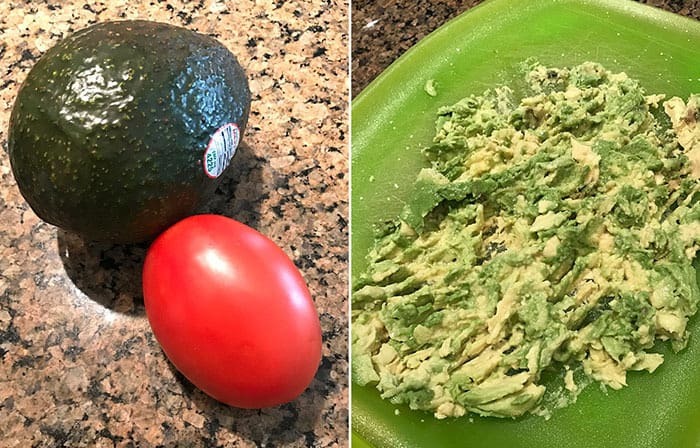 It will make a slight indention if the avocado is ripe. If it feels hard, then it needs to sit on the counter for a couple more days. And if you have too many avocados that appear to be ripe, just put a couple in the fridge to preserve for a day or two. If you want to make these REALLY great, use a couple of slices of my homemade french bread or cracked wheat bread, instead of english muffins. Yum. on Amazon as well. I love mine. It’s quick and easy and it makes a perfect poached egg every time. And they are fairly inexpensive. If you are watching calories, you can skip the cheese, buy light english muffins, and use a very light spreading of avocado. But remember, avocado has good fats so it’s worth the extra calories. 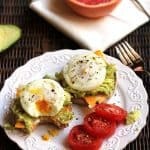 Either way, Poached Egg Avocado Muffins are healthy and simple to make, and are out of this world GREAT. Using a poached egg pan, fill base with about an inch of water plus a splash of vinegar. Turn burner to high and heat to boiling. Remove lid and crack four eggs into each egg pocket, careful not to break the yolks. 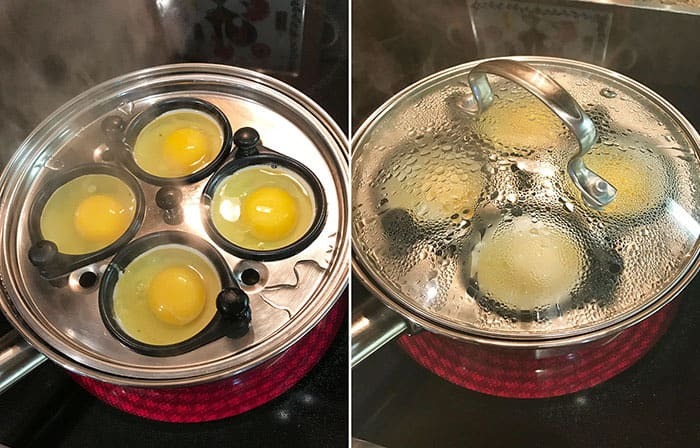 Return lid to pan and let eggs cook for four to five minutes, depending on how runny you like your eggs. Remove eggs to plate lined with a paper towel. While eggs are cooking, toast two english muffins in toaster. Add a light spread of butter. Mash one large avocado onto plate. Add a sprinkle of salt. To assemble, spread one fourth of avocado on each of the buttered english muffin halves. Top with a slice of colby jack cheese, and then with a poached egg. Sprinkle with salt and pepper and serve immediately. Mmmmm these avo-egg muffins are perfection! 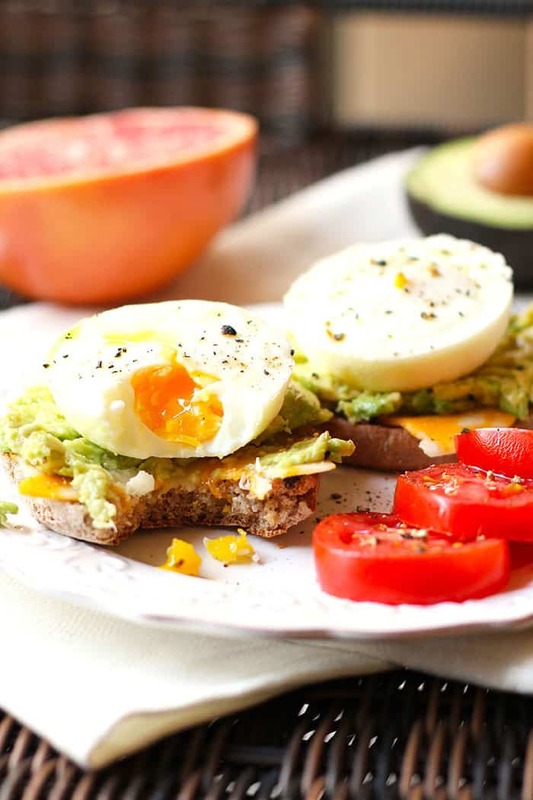 I LOVE that combo of avocado and eggs, so filling and delish! I would definitely make this for a quick and easy lunch or dinner!